Our first two days on Hvar Island were stunning, absolutely clear blue skies and warm. Sadly on the third day of our week here the spring rains arrived and it poured non stop for 2 days. We had one cloudy day with the sun peeking out for a short while, so off we dashed to look around and enjoy lunch in the town square. 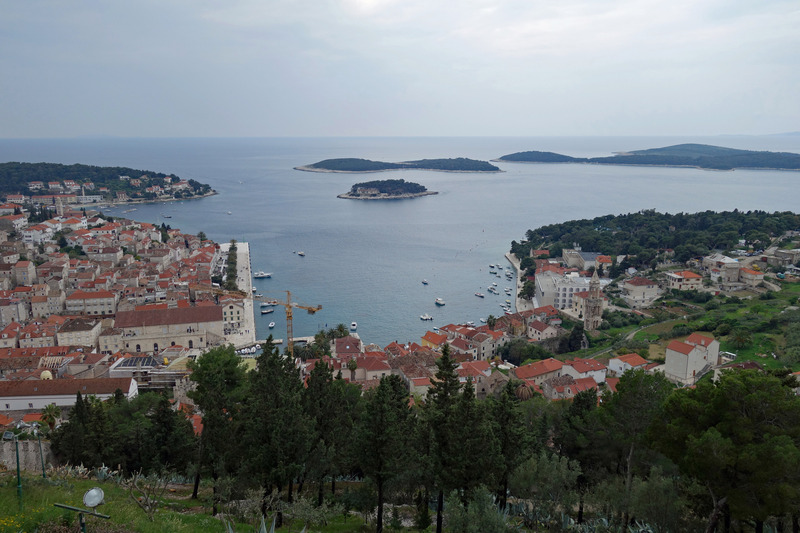 After that, it rained until our departure 🙁 Even the bad weather would have been manageable if we had a gym to spend time at, but alas, there are no gyms in Hvar town. Our arrival to Hvar had an interesting start. Checking in at the Jadrolinija ferry office in Split that morning we were informed our 2 pm catamaran ferry was cancelled due to high winds and we had to take the slow as molasses car ferry from Split to Hvar. 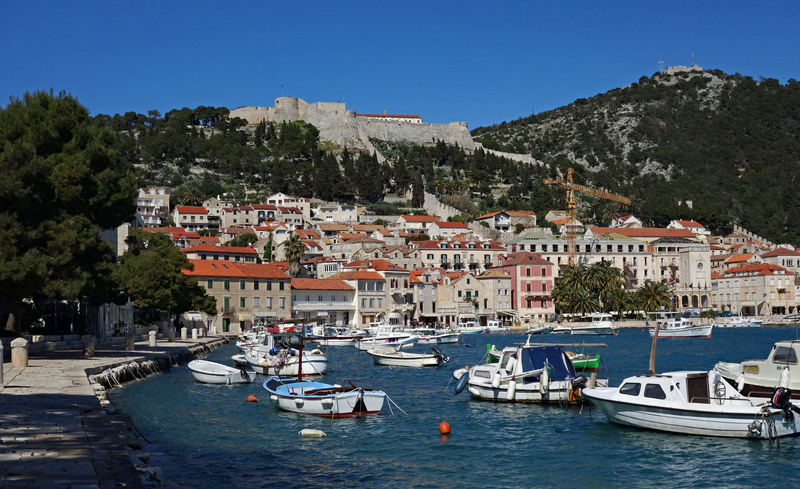 Not only was the journey twice as long, we ended up in Stari Grad, the wrong port on the other side of the island. No buses or taxis were to be found upon our arrival but fortunately a fellow we met at the port in Split, and spent the ferry ride chatting with, called his hotel and had them send us a taxi. The taxi cost a shocking 305 Kuna (50 USD) for a 20 minute ride, yikes, that is more than double the cost of the 2 hour ferry all the way from Split!!! Because we are here in slow season the buses are not running regularly so we had no choice but a taxi 🙁 Oh well, putting our travels behind us, we were met at our latest apartment by our host Ivo, who offered cookies and apple juice while he showed us around the apartment and described points of interest on the map of Hvar. A quick trip to the grocery store, only 200 meters away, and we were ready for a quiet evening at home. Tony, our travel companion from Split to Hvar came to the island to participate in an Otillo swim/run event, which we had never heard of but are very popular in Europe. The sprint distance he was doing consisted of 1.6 km swimming over 4 sections and 10.2 km running over 5 sections, totaling 11.8 km. 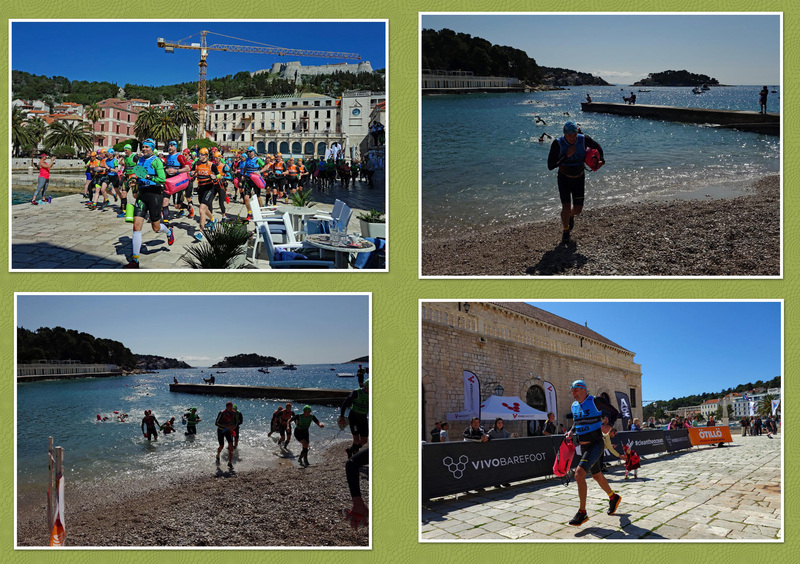 It is an interesting format with ocean swimming interspersed with running sections over a one loop course, so you swim in your running shoes and run in your swim gear. Almost all the participants used hard paddles on their hands and a flotation device between their thighs to aid on the swim, which I assume must help offset the weight of the running shoes. On Saturday we headed to the the town center to watch the start, and say hello to our friend. Once the race started we had time to make it to the exit point of the first swim and cheer everyone on. From there the race headed further around the island so we went back to the start/finish line to watch the racers finishing. It was an unexpected and fun way to spend a couple of hours. The Otillo Hvar race, new friend Tony on the right. When it was not raining we did a little sightseeing and lots of walking along the water in both directions from our apartment. This is a very quiet island in the off season and quite honestly there is not that much to see. The island’s popularity is based on being an upscale party island…which was certainly not the case at this time of year!! 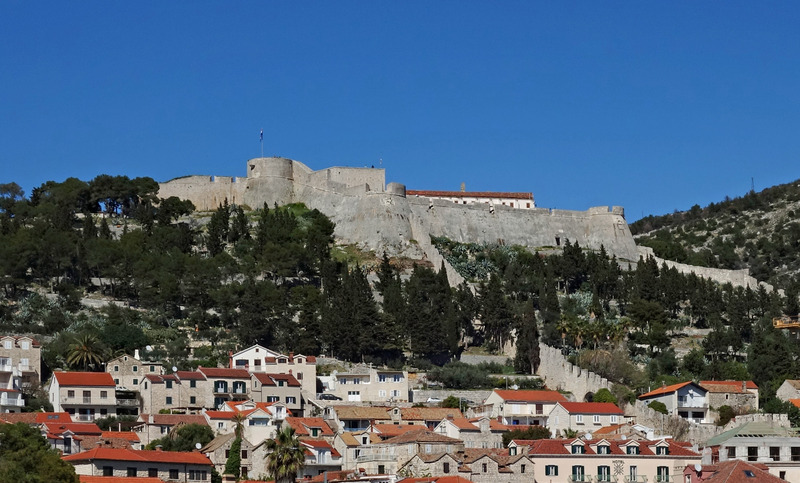 Sitting on the hill above Hvar Town is the Fortica (Spanish Fortress). This medieval castle occupies the site of an ancient Illyrian settlement dating from before 500 BC. In the 6th century the Romans added to the castle as did the Venetians in the 13th century. By the middle of the 16th century the fortification was largely completed. 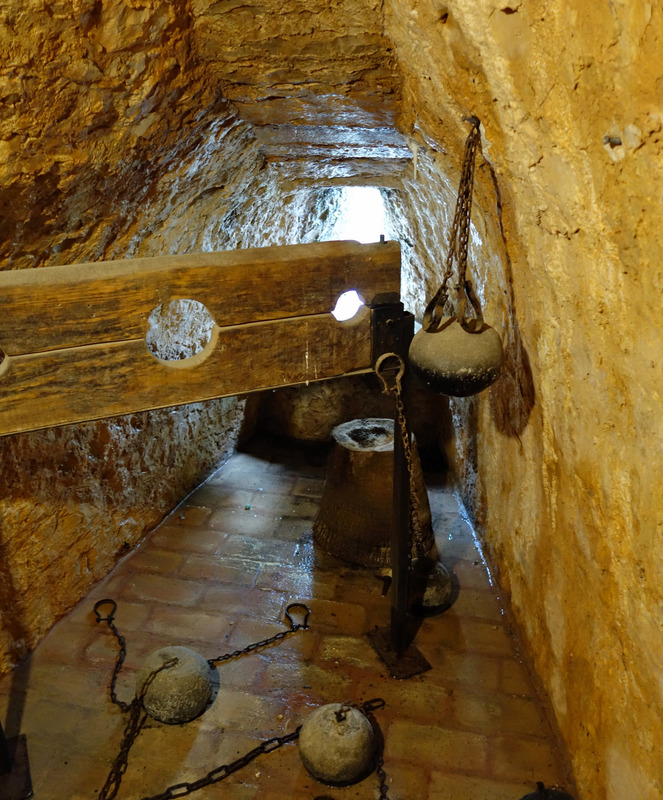 The most interesting parts of the castle are the sinister dungeons and the views looking down over old town and the Pakleni islands, well worth the trudge up through the old-town streets and the tree-shaded hillside. 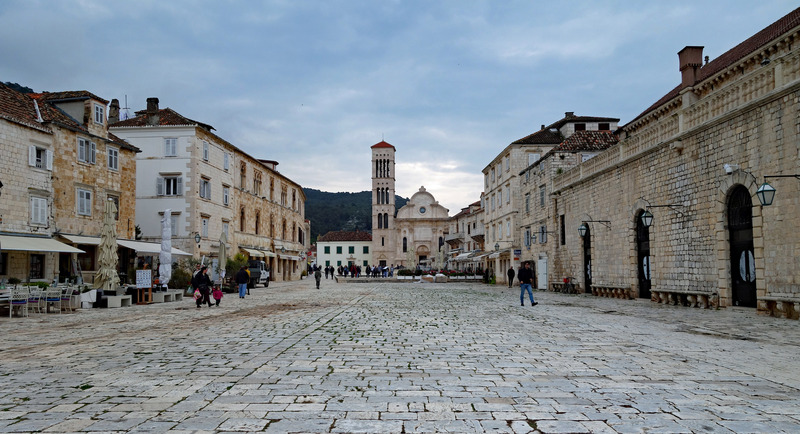 The town square in Hvar is one of the largest old squares in Dalmatia. Stretching from the harbor to the cathedral, this impressive square was formed by filling in an inlet that once reached out from the bay. 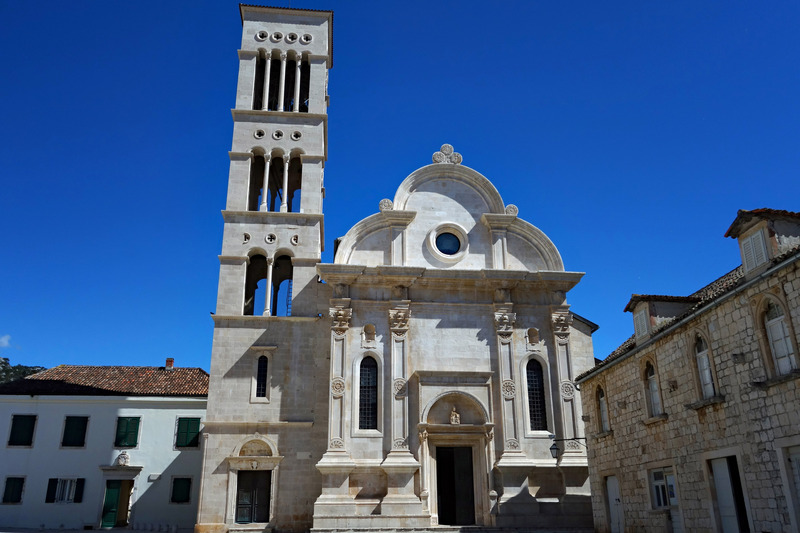 It is pretty much the hub of all activity in Hvar Town. Providing a backdrop to the square is the baroque cathedral, built in the 16th and 17th centuries to replace a cathedral destroyed by the Turks. While inside the cathedral is fairly uninteresting, the most distinctive feature is the bell tower, which has an additional window on each level giving it a strange top-heavy appearance. 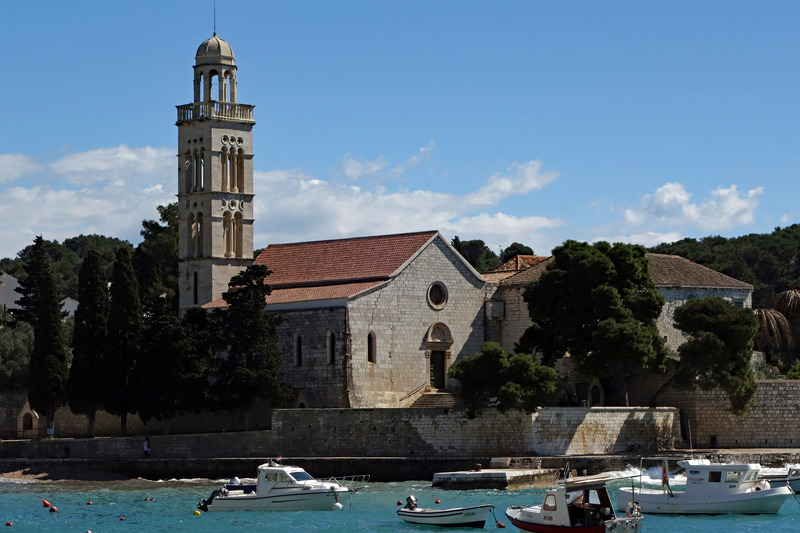 Overlooking a pretty cove between old town and our apartment is the Franciscan Monastery. This 15th century monastery has an elegant bell tower, built in the 16th century, and a Renaissance cloister leading to a small church. So despite the pretty pictures showing our brief bouts of nice weather, in my opinion coming to Hvar in April or too early in the season is not worth doing, there is very little to do at this time of year. Secondly, I would recommend renting a car, which we would have done had the weather been nicer. There are many other small towns, numerous beaches, vineyards and lavender fields that would all be worth visiting, in addition to the myriad of boat tours to neighboring islands which run in the summer. I think we are both ready to be moving on to our next and final stop in Croatia, Zadar…..